Vladimir Melnikov from Tomsk created a team called “Strange People” to join in city clean-up operation. The number of volunteers is more then 750 people. Postgraduate student Vladimir Melnikov, 24, comes from the Siberian city of Tomsk, where he teaches at the university, runs his own Internet company and, for the past two years, has been voluntarily removing litter from the city streets. The amount of rubbish already cleared away can be counted by the tons. Even quite recently, people in Tomsk would glance at Vladimir and his pals, twirl their fingers at their temples and say: “You’re off your rockers, you lot!” People could not get their heads around these young men, who were busy stuffing industrial sacks with street litter. “They must be doing it for money!” people said. No one could believe that these young men would spend six hours each weekend cleaning up the city for free. Vladimir is a philosophy graduate and has no affiliations with either political movements or ecological groups. His hobby of clearing litter actually began over a bet. “I was sitting with my mates in the kitchen, and – well, you know how it is – we somehow began chatting about politics. Everyone was laying into the local officials, saying how they can’t even keep the streets clean – they can’t even clean up the park? But several of us, including me, got tired of going around in circles with this, when someone said: ‘Why don’t we clean it up ourselves?’” says Vladimir. The next day, Vladimir met up with his friends in the park opposite Tomsk City Hall. There was an impressive trash bin: People had been dumping rubbish onto it since the 1990s. They quickly realized that the three of them would not make any kind of dent on a problem that big. Thus, Vladimir created a social group on the Internet called “Strange People,” requesting that others help join in on a Saturday clean-up operation. Twenty volunteers signed up. The results of their first day’s clean-up in the park: They managed to bundle up 100 industrial-sized trashbags, each one-half the size of a person. This was in July 2011, and no one really knows exactly how much litter Strange People volunteers have cleaned up since then. The figures run into the tons, and the number of volunteers has since sky-rocketed to 756 people. “What I’ve found out is this – that you can accomplish a hell of a lot just using your own two hands! And you don’t need any help from pen-pushers, and you don’t need their cash,” says Vladimir. Tomsk is a city of half a million people and dozens of grim back alleys. These backstreets all usually look pretty similar: grown over with weeds, illicitly built car garages, broken-down buildings and heaps of rubbish. No surprise, then, that they are also home to alcoholics and addicts. These dives make a convenient place to disappear from unwanted gazes, by day or night. In fact, these back alleys really belong to no one – and as soon as there is no owner, no one cares a bit about cleaning them up. Except, that is, the volunteers. For all of last summer, Tamara was heading a project called Gogol Avenue. With her friends and her husband, she turned a beaten-up alley in the Tomsk city center into a recreation zone. On one side there were old tram-lines, while a derelict building stood on the other side – an abandoned communications college owned by the Defense Ministry. No one would ever have thought of taking a stroll there, to say the very least. Even with the heaps of rubbish and overgrown weeds removed, it still looked grim. “Over the past two years I’ve come to the conclusion that problems don’t get fixed through string-pulling or with money, but just by normal conversations on a personal level,” Vladimir says. 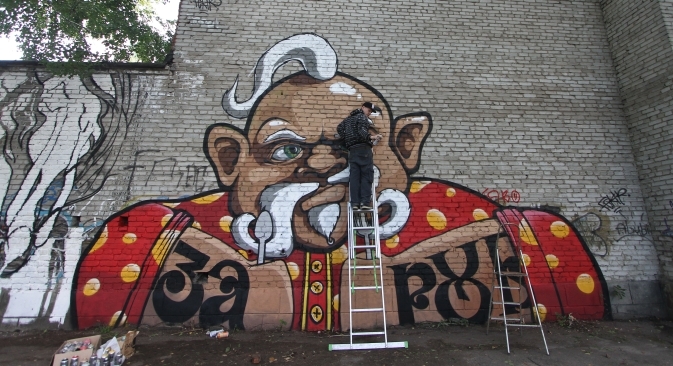 "Strange People" volunteers decorated the abandoned building and the long, adjacent brick wall with a mural on themes from the works of classic Russian author Nikolai Gogol. It was the first outdoor art gallery in Tomsk. By the fall, people were taking their first excursions around it. When Tomsk lays snowbound in the winter, Strange People volunteers help people with snow-clearing who cannot manage by themselves – people such as workers at the stray animal sanctuary. As soon as it is warm enough, new weekend clean-ups begin in the back alleys, and volunteers work to turn them into public spaces. Basically, this is a guided tour that residents and visitors can take without a guide. Now, to find out anything about any building in Tomsk, all that is required is a fairly modern smartphone equipped with QR code software. QR codes are the “strange squares” that have cropped up recently on everything from posters to business cards. A QR code placard is attached to a building, enabling anyone with a smartphone to read the code and receive instant information on their device. This makes Tomsk one of the first cities in the world where tourists can wander around by themselves, without the costs of a tour-guide. It sounds pretty strange – but then again, with Strange People in charge of the project, it was always likely to turn out that way.